Email inboxes are receiving a barrage of mail encouraging consumers to monitor their credit. The emails may offer a link to one of the three credit bureaus: Experian, Equifax, or TransUnion. The fact is, these emails may have different purposes. Some are merely intended to sell you a service you don’t need, while others are a scam designed to take you to a phishing or malware download site. Last year was a terrible year for retailers and consumers alike as one data breach after another played across the news cycles. Millions of consumers had their credit cards replaced by their banks to fend off fraud. Things went from bad to worse when Anthem announced it’s health network had been compromised. Fast forward to 2015 and is it any wonder the bad guys are playing on consumer fears? Here’s just one example, but all of these “credit monitoring” emails work about the same. Let’s examine one closely. First, let’s assume you’re not paying attention and just click the big button labeled “See it now.” The first thing you notice is that you’re not going to the listed domain, but to joinnow.ndmsh.work. However, before you can respond, you’re transferred to gofreecredit.com. You may breathe a sigh of relief, but this should have been a red flag. Why would a legitimate credit monitoring organization enlist the help of affiliates to market their service? Here’s the juicy stuff. Gofreecredit.com has a poor rating on WebofTrust.com, yet it has an A+ rating with the Better Business Bureau. On WebofTrust.com, the reasons for the poor rating include: spam, scam, misleading claims, online tracking, and more. On the BBB.org site, similar complaints were met with a generic response of “we apologize for any inconvenience. Please provide us with the email address that you used to sign up with, so we may further investigate.” It would appear that when the consumers took no further action, the complaints were considered “resolved” and the A+ rating remained. 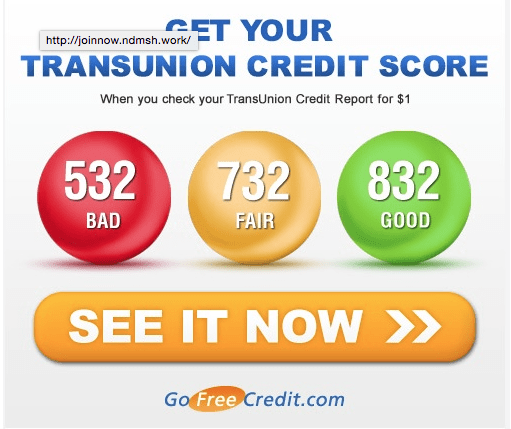 By the way, to get a your free credit report from gofreecredit.com, you’ll need to pay a processing fee. Still not convinced the processing fee is a bad thing? Note that a security check of the gofreecredit.com website revealed their website software is considered outdated and high risk. Remember, you can always get your really free credit report for absolutely nothing direct from the credit bureaus. Experian: experian.com, Equifax: equifax.com, and TransUnion: transunion.com.